Cuba grows lots of tropical fruit, coconut, cacao, plantain, rice, beans, and tubers of all sorts. And these ingredients abound in Cuban cuisine. As does seafood, pork and chicken. Lamb is a rarity and though you'll find it on the menu, it's seldom actually available. I don't think we encountered any beef at all. Food in Cuba shows significant Spanish and African influence too. Cuba was a Spanish colony for around 400 years and African slaves worked for the colonisers on their plantations for almost as long, until slavery was abolished in 1886. Cuban food relies on the produce of the land, and this land does not grow spice! It's therefore easy to call the food in Cuba, bland. I really enjoyed the flavours of the meat and vegetables though - and I do believe that you don't always need more than a brilliant dash of garlic. 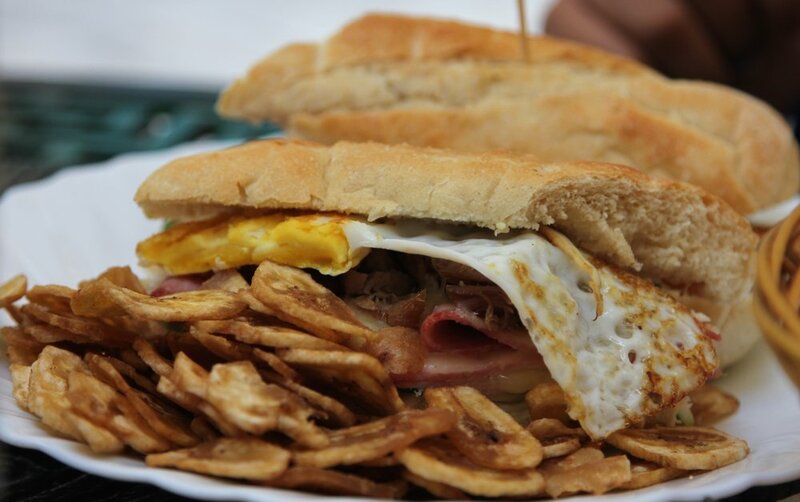 The Cuban sandwich in all its glory: ham, pork, cheese, egg, mustard, butter. There are a few variants of this out there too, with or without egg and mustard, for example. What took me by surprise was the Cuban baguette - I expected the sandwich to be quite hard to bite through, requiring some serious dental action with significant yanking. However, it was quite soft and crumbly! This is pollo a la parrilla con ajo; grilled chicken with garlic. A Cuban paladar (private restaurant) will typically have a menu offering different kinds of seafood and meat, either roasted, fried or grilled. This is usually served with a side of boiled vegetables or a salad, fried potatoes or plantain, and a portion of rice - either white, with black beans or with vegetables. We had this particular grilled chicken al fresco in Vinales at a nice paladar called La Cuenca. The Cuban flan. I usually call this caramel custard! This appeared to be Cuba's only real dessert option interestingly...I did think that with the amount of sugarcane they produce, there would be others. Looks like it all goes the rum way! Guava pastal. This is a great snack - savoury puff pastry filled with sweet cooked guava. We had it for breakfast at Clarita and Orlando's casa in Havana and also at a little joint by the road on our drive to Vinales from Havana. Though coconut trees grow everywhere in Cuba, it was only in Baracoa that the coconut appeared to be used extensively in cooking. Interesting! Lechita is a coconut sauce, very Asian in flavour, and tastes especially nice when cooked with seafood. This is pescado con leche de coco at La Punta in Baracoa. It is also fantastic at La Terraza next to the Cathedral. Viandas frites - no Cuban meal is complete without some fried vegetable/tuber on the side. This could be plantain, yam , potato, cassava, malanga. We've had a variety of frites in our time at Cuba, but these two were exceptional. The first was at a restaurant in Sierra Maestra, very close to where you begin your climb up the Big Rock. The other was at a fisherwoman's house in Baracoa. Cuba was a Spanish colony for around 400 years. The Spaniards identified 7 areas in Cuba that were rich in resources and established settlements there, one of which was Santiago. Therefore, a seafood paella on the menu wasn't a surprise. This paella at Setos restaurant in the Vista Alegre area of Santiago was tasty but very expensive! We ordered it off menu and did not ask what the price was, presuming it would be the same 6 - 8 cuc that the other things on the menu were. It was 25 cuc! Learned our lesson, we did. So my advise is, eat a paella, but maybe not at Setos. And definitely find out how much it costs before you order it. Same goes for everything else in Cuba too. Tourists are very often ripped off and you must bargain! Breakfasts at Casa Particulares in Cuba begin with generous portions of delicious tropical fruit. I've had my heart's fill of pineapple, pink guava, papaya and banana. Even plucked guava straight off the trees! Enchiladas in Cuba aren't what they are in Mexico, I learned! This is a tomato, onion and garlic sauce based dish, eaten with rice. I tried the shrimp enchilado in Camaguey at a restaurant called 1800. A tasty surprise indeed. 1800 is on Plaza San Juan Dios - a large open square with a cathedral, colonial homes and restaurants around it - in the evening, there is usually live music at the restaurants, and it's a very pleasant and relaxed dining experience out in the open. Remember to take mosquito repellent though! I have a thing for croquettes. There, I've said it. These were fishy ones, yum, at La Bodeguita del Medio. The original La B in Havana is 500 years old, and has had famous patrons including Neruda and Hemingway. These croquettes are from the Trinidad La B. Great live music and a fabulous afternoon spent sipping Cuba Libres and people-watching The other place we had excellent croquettes was El Olivio in Vinales. We spent a day on horseback in Trinidad. Riding to the Hoyo de Pilon falls, swimming around there, and then riding back (highly recommend this, by the way). We got caught in a thunderstorm on the way back, which was a uniquely exciting experience. We stopped by a local joint for some sugarcane juice (spiked with rum of course!) and ended up eating some fantastic Cuban food. Prawns sautéed with plenty of garlic, rice with black beans, salad and some malanga with a tangy chilli sauce of some kind. Drenched but oh so happy! We'd heard that the best food in Cuba is at a Casa Particular - the home of a Cuban with rooms let out to tourists. We stayed at Casas throughout our stay in Cuba, and had a fantastic dinner at Casa Jose y Fatima in Trinidad. Fatima is an excellent cook and made us a 5 course spread! This is the roast chicken and grilled fish main, served on glazed pineapple with a mashed potato side. SO GOOD! The other fantastic Casa meal we had was at Roy's Terrace in Santiago. Roy is an English professor at the University and his mother is a paediatrician. 12 years ago they decided to take on work as cleaners on a ship, to earn some extra money to start their Casa Particular business. Today, their Casa has the most delightful rooftop dining space where you can eat a 7 course spread homecooked by his Aunty under a canopy of flowering climbers that his Uncle planted decades ago, when they first dreamed their dream. This is a delicious plate of food at Los Cospiradores in Trinidad in Cuba. The fish just melted away, the flavours were simple and delicate, but unmissable. The best bit about this place was the ambience - al fresco, candlelight, in the shadow of the giant stone stairs of Casa de la Musica in Plaza Mayor, where there is always music, dance and good cheer. You have to have Churros at a street stall. This is from Havana. One of my favourite meals in Cuba was a simple and delicious dinner at the home of the fisher woman who took us out on a boat to see the coffee plantations on the banks of the Yumuri river in Baracoa. We had Dorado fish, yam fritters and rice, to the sound of crashing waves and the cool ocean breeze. I was really surprised at the number of pizzerias in Cuba. There are the little peso pizza joints and also the larger sit down places. The pizza has a fairly dense base, and doesn't necessarily involve tomato sauce. This one had olives, onions, shrimps and cheese. If you're a vegetarian in Cuba, life isn't as difficult as you may think it is. One of the four of us was vegetarian, but everywhere we went, people were more than happy to put something together for him if there was nothing vegetarian on the menu. This is arroz con frijoles (rice with black beans) and sautéed vegetables. The other highlights of the food in Cuba were bocadito de queso, that's cheese balls, and brochettas or skewered meat. I didn't see these anywhere apart from in Havana, but most paladars in Havana Vieja (Old Havana) served these. Cuba is an incredible country, and its food is just one element of its rich history and culture. I didn't go for the food, I went for everything else, but I came back with my mouth tingling with the taste of it.